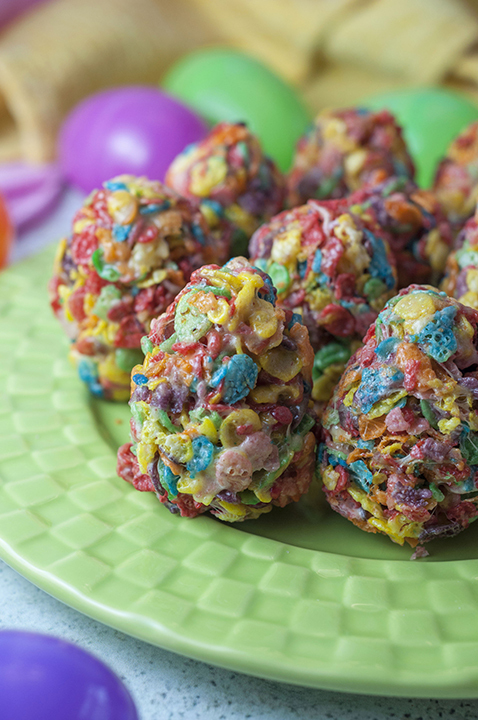 These Fruity Pebble Easter eggs dessert treats are made with three simple ingredients: cereal, marshmallows and butter. Shape them into Easter eggs to make a fun, easy, no-bake treat for the holiday! 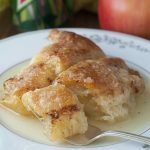 Are you sick of the sweets yet this week on Wishes and Dishes? Stupid question, right? I mean, who would be sick of sweets? 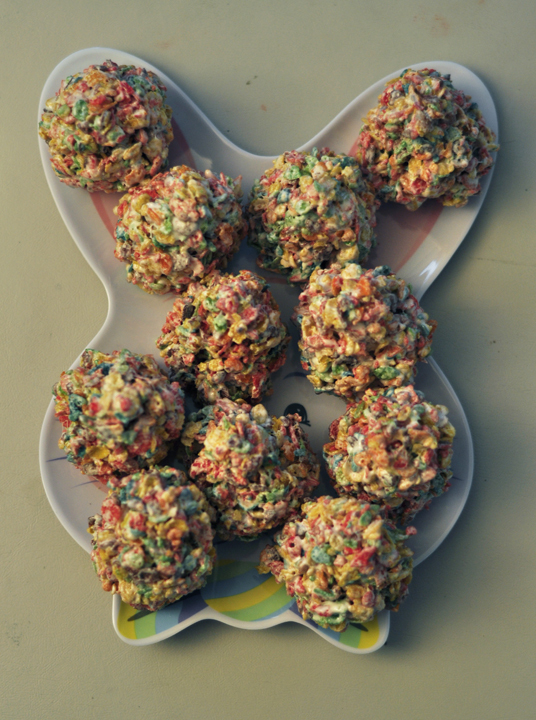 These fruity pebble Easter eggs are not the most fancy or impressive thing to ever come out of my kitchen, but they are FUN and easy and that’s all that matters sometimes! I’m a firm believer that not everything that is worthy of making has to be complicated. 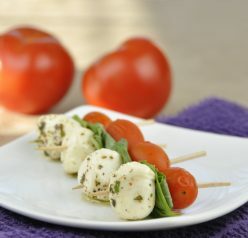 You can make these with your kids for Easter and they would have a blast. You essentially just mix the ingredients and then stuff them in plastic Easter eggs (or use your hands to shape them into eggs – the plastic eggs are not vital to this recipe). I made these for Easter one year and everyone really enjoyed them, kids and “big” kids alike. They are very similar to rice krispies treats, just more colorful! 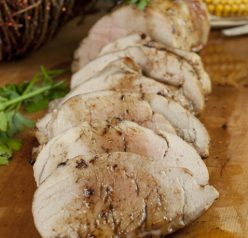 You can easily adapt this recipe to use any cereal that you want to. The Fruity Pebbles were perfect for Easter because they are so colorful and “spring-like”, but don’t feel confined to using them. Cocoa Pebbles made into gingerbread men for Christmas even sounds like a brilliant idea! Enjoy and have a great weekend! If you’re into super fun Easter desserts, check out this Easter Bunny Bait or this Salted Caramel Easter Popcorn. You will also love these Cadbury Mini Egg Cookies from my friend Dorothy that are chocolate chip cookies with a fun Easter twist or these Easy Jelly Bean Flower Cookies that are sugar cookies perfect for Easter or Mother’s day! Also, did someone say Fruity Pebbles French Toast?! In a large saucepan melt butter over medium heat. Don't let it burn! Pour in the cereal and mix to incorporate everything. Spray plastic eggs with cooking spray (the ones that split vertically work the best). OR USE YOUR HANDS TO SHAPE EGGS. You could just use 1 or 2 eggs for this process to make them all as the cereal does not take long to take the shape of the egg. That way you only dirty a couple eggs. Spoon the cereal mixture into each half of the egg then close egg to form shape. Pop cereal out after about 10 seconds. You can also do this by hand without the plastic eggs. Place the finished eggs to dry in a muffin tin or on waxed paper. Keep these in an airtight container for up to 1 week. Hello Ashley, your the place to visit if I want to look at some sweet treats. Fruity pebbles used to be one of my favorite snack cereals when I was a little kid. Shaping them like eggs is so fun for this time of the year. It was my favorite cereal too! This has got to be the cutest recipe ever! Can’t remember the last time I had Fruity Pebbles but as soon as I saw your photos it brought the flavors back. So fun for spring and Easter. And they’re even on a cute bunny plate. 🙂 This recipe is fun! adorable! 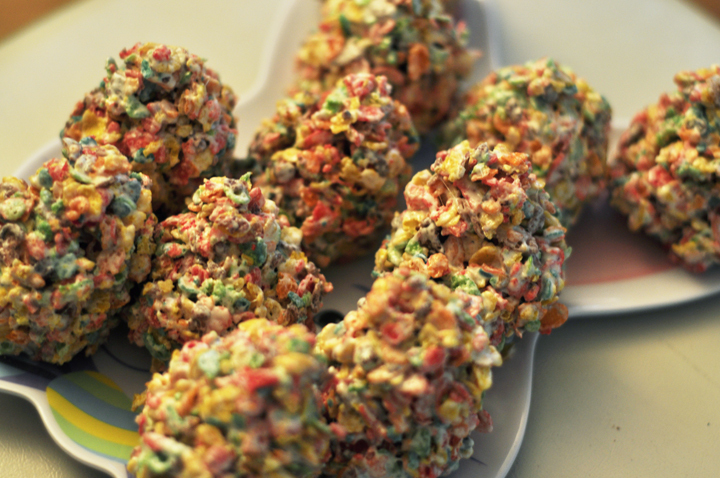 fruity pebbles are both pretty AND tasty and what an awesome idea to make an egg shaped treat with them!! These are so much fun and those colors are perfect for Easter! This looks like something my 3 yr old would enjoy making with me! So cute! Excellent to make with friends / kids. I used to eat Fruity Pebbles as a kid. And now I can eat them again… whoo hoo! These look great, Ashley! I love Fruity Pebbles! I hadn’t had them in years until I worked with them for a paid campaign a couple months ago and now I’m addicted. I actually had a granola bar with some this morning after I failed at making oatmeal twice. It’s been one of those days. I have those days all the time!! Such a cute idea! I love marshmallow treats!